RSCDS Chair Jim Healy presented their highest accolade, the Scroll of Honour, to Duncan MacKenzie at their AGM in Perth on November 5, 2016. Photo provided by Stewart Cunningham. Duncan MacKenzie has been a member of the Vancouver Branch of the RSCDS since approximately 1986. He was Vice Chair of the Vancouver Branch 1990-91, and was Branch Chairman September 1991 to September 1994. Duncan received his Full Teacher’s Certificate in 1995. He received a Branch Award in 2006. Duncan MacKenzie is one of the most enthusiastic exponents of Scottish country dancing likely to be encountered. He helped establish, and teaches at the West End Class in Vancouver. He was also involved in starting a class at Simon Fraser University in Burnaby, BC, and he has travelled widely to teach at workshops within the Province of British Columbia, and elsewhere in western Canada. Duncan has been a member of the Vancouver Branch Demonstration Team for many years, during which he has had several stints as Team Manager. 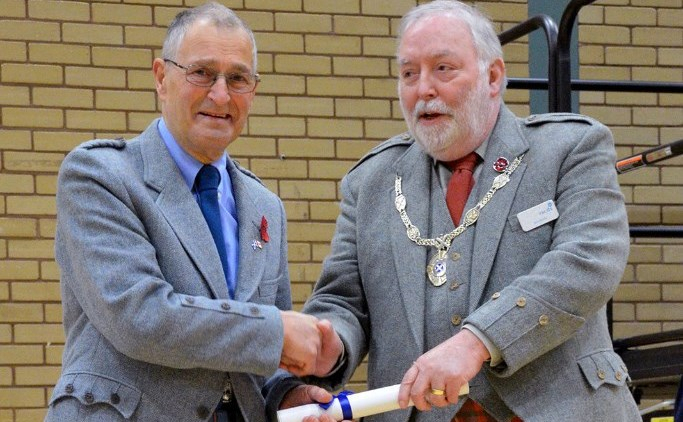 He has also organised and taught classes to prepare people with no previous SCD experience to be able to dance at the annual St. Andrews Ball, put on by the Vancouver St. Andrew’s and Caledonian Society. Duncan instigated, and runs monthly ceilidh dances at Vancouver’s Scottish Cultural Centre. These events are designed to introduce people with no Scottish country dancing experience to the activity. Duncan begins these evenings with an hour of instruction on the formations to be included in the ceilidh dances. After the lesson, the ceilidh begins, complete with live music. Needless to say, the subtleties of RSCDS dancing are largely missing at Duncan’s ceilidhs, but a number of ceilidh attendees have gone on to join the Vancouver Branch and become more refined Scottish country dancers. Duncan has also traveled near and far to stage ceilidhs at weddings and other private events, once again introducing the public to Scottish country dancing. The Vancouver Branch hosts summertime outdoor SC dancing on Monday nights in Stanley Park. Duncan rarely misses a dancing evening at the park, and if he isn’t handing out pamphlets on dance classes starting in the fall, he will be seen getting spectators up to try dancing, or coaching sets of beginners through a dance. Duncan has contributed many innovative ideas to events put on by the Vancouver Branch. He chaired the committee for the first Whistler Weekend in 1995, and 400 dancers from far and wide attended this highly successful event. He also conceived and chaired the Millennium Ball held on New Year’s Eve, 1999, bringing over the John Ellis Band to play for the event. He also chaired the Pacific Spirit Ball in 2002, with the David Cunningham Band. Based on the above described long service of Duncan MacKenzie supporting and promoting the activity of Scottish country dancing in the Vancouver area, the Province of British Columbia, and other parts of western Canada, the undersigned nominate him for an RSCDS Scroll of Honour.